Every history has its beginning and computer game is no exception. 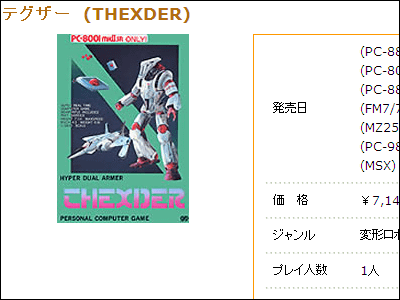 "Thexder" is one of the first robot action game from Game Arts. First it came for PC-8801mkIISR and transferred to various consoles. It's favored for the smooth animation, fast 8-direction scrolling and realistic robot that transforms to fighter plane(imagine Macross). And now, for further evolution, the game seems to be coming to PS3 and PSP. Read on for detail. ESRB(Entertainment Software Rating Board) revealed on their announcement that Square Enix has sent an application for rating of "THEXDER NEO" the latest sequel. According to the application, "Thexder NEO" is for "Everyone". Players "control a transforming robot" and "must destroy enemy robots" "with laser beams". Enemy disappears "in a colorful burst" while boss fights are depicted in more louder and realistic explosion. So, will this really come true? Chances are fairly good. As you can see in coming back of "Spelunker" after 20 years and sequel for Wizardry, it seems to be a trend that game manufactures are keen on reviving ancient masterpieces. Here's their official site (in Japanese). They are keeping silence for now, but there soon will be some information.